Shades of Hunter S. Thompson color AIRBOY, starring acclaimed author James Robinson (Starman, Fantastic Four) and artist Greg Hinkle (THE RATTLER) as they attempt to reboot the Golden Age hero. When the actual Airboy suddenly shows up after a boy's night out of debauchery, a hangover becomes the least of their trouble. Added Hinkle: "As a reader, I always enjoy bonus material, so I'm really excited to share some more process pages, preliminary work, and even a little sample of how our collaboration worked." 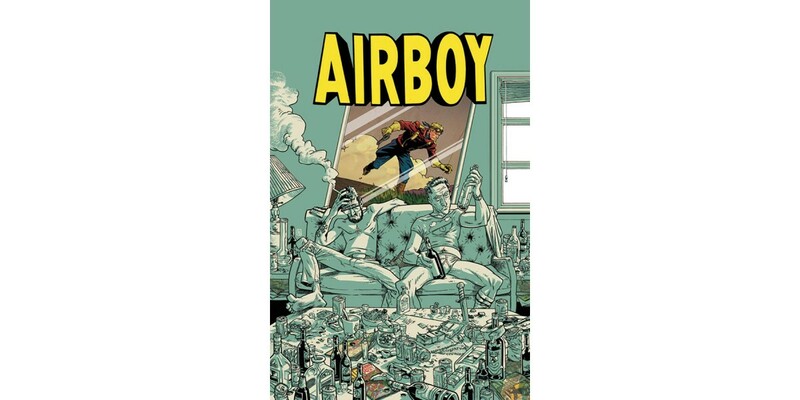 AIRBOY DELUXE HARDCOVER (ISBN 9781632155436) hits comic book stores Wednesday, April 27th and bookstores Tuesday May 3rd, and will be available for $24.99. It can be ordered by Diamond Book Distributors with Diamond code FEB160620, and it can be preordered now on Amazon, Barnes and Noble, Indiebound, and Indigo.